This St. Patrick's Day hat with its green shamrock and gold buckle will be in good taste at any Irish party, but watch out a leprechaun may want it back. This jumbo sized St. Patrick's Day hat is suited for a giant leprechaun. The Kelly green leprechaun hat is made of velvet and features a bold embroidered forest green shamrock with gold trim and a green belt with a gold buckle. 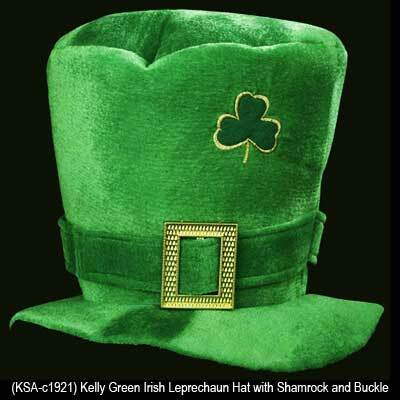 The shamrock hat from The Irish Gift House measures 10" tall x 12 1/2" wide and one size fits most.